Soldier On is a non profit that since 1997 has been dedicated to helping veterans achieve a basic standard of living with permanent housing, social services, and the security of knowing that someone cares for them, but Jack Downing, the CEO of Soldier On, knew that more could be done. In 2011 Mr. Downing and I met at a Department of Defense conference and exchanged ideas about how chiropractic care could help veterans improve their physical and emotional health. Those talks and many more led to the launch of The Resiliency Program in 2014, which is quickly becoming the go-to program for veterans and active duty personnel with chronic and “untreatable” health issues. “A lot of people with mental disorders, addictions and traumas, which homeless veterans often have, can’t connect the dots the way you think they should,” says Downing.” I was frustrated with what I’ve seen our veterans experience in failed treatments. So I thought, ‘Let’s try this. '” So far, Downing is impressed with the results. “We started to see a significant calming effect in our residents in our communities,” he says. “They had more ability not to go into crisis mode and were better able to manage their anger and rage. In a pod where all veteran inmates are housed in an Albany, N.Y. prison, one of the guards commented that this was the first time in his career that inmates weren’t yelling and screaming at him. 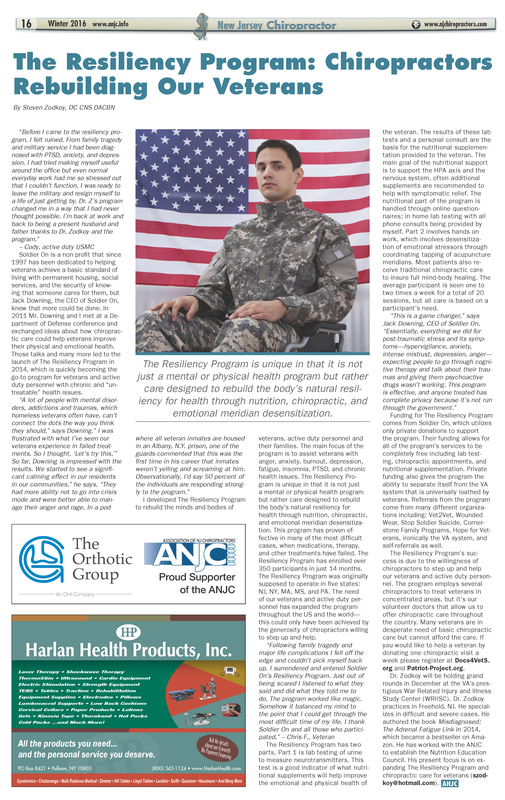 Observationally, I’d say 50 percent of the individuals are responding strongly to the program.” I developed The Resiliency Program to rebuild the minds and bodies of veterans, active duty personnel and their families. The main focus of the program is to assist veterans with anger, anxiety, burnout, depression, fatigue, insomnia, PTSD, and chronic health issues. The Resiliency Program is unique in that it is not just a mental or physical health program but rather care designed to rebuild the body’s natural resiliency for health through nutrition, chiropractic, and emotional meridian desensitization. This program has proven effective in many of the most difficult cases, when medications, therapy, and other treatments have failed. The Resiliency Program has enrolled over 350 participants in just 14 months. The Resiliency Program was originally supposed to operate in five states: NJ, NY, MA, MS, and PA. The need of our veterans and active duty personnel has expanded the program throughout the US and the world- this could only have been achieved by the generosity of chiropractors willing to step up and help. The Resiliency Program has two parts. Part 1 is lab testing of urine to measure neurotransmitters. This test is a good indicator of what nutritional supplements will help improve the emotional and physical health of the veteran. The results of these lab tests and a personal consult are the basis for the nutritional supplementation provided to the veteran. The main goal of the nutritional support is to support the HPA axis and the nervous system, often additional supplements are recommended to help with symptomatic relief. The nutritional part of the program is handled through online questionnaires; in home lab testing with all phone consults being provided by myself. Part 2 involves hands on work, which involves desensitization of emotional stressors through coordinating tapping of acupuncture meridians. Most patients also receive traditional chiropractic careto insure full mind-body healing. The average participant is seen one to two times a week for a total of 20 sessions, but all care is based on a participant’s need. “This is a game changer,” says Jack Downing, CEO of Soldier On. “Essentially, everything we did for post-traumatic stress and its symptoms- hypervigilance, anxiety, intense mistrust, depression, anger- expecting people to go through cognitive therapy and talk about their traumas and giving them psychoactive drugs wasn’t working. This program is effective, and anyone treated has complete privacy because it’s not run through the government.” Funding for The Resiliency Program comes from Soldier On, which utilizes only private donations to support the program. Their funding allows for all of the program’s services to be completely free including lab testing, chiropractic appointments, and nutritional supplementation. Private funding also gives the program the ability to separate itself from the VA system that is universally loathed by veterans. Referrals from the program come from many different organizations including: Vet2Vet, Wounded Wear, Stop Soldier Suicide, Cornerstone Family Programs, Hope for Veterans, ironically the VA system, and self-referrals as well. The Resiliency Program’s success is due to the willingness of chiropractors to step up and help our veterans and active duty personnel. The program employs several chiropractors to treat veterans in concentrated areas, but it’s our volunteer doctors that allow us to offer chiropractic care throughout the country. Many veterans are in desperate need of basic chiropractic care but cannot afford the care. If you would like to help a veteran by donating one chiropractic visit a week please register at Docs4VetS.org and Patriot-Project.org. Dr. Zodkoy will be holding grand rounds in December at the VA’s prestigious War Related Injury and Illness Study Center (WRIISC). 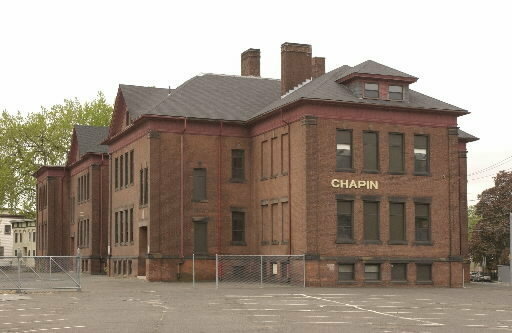 CHICOPEE – Renovations inside and outside of the former Chapin School are progressing and officials are hoping formerly homeless veterans will be able to move in this summer. “Construction is underway and we are looking for a late June completion,” Gary Shepard, president of Soldier On, said. Soldier On, a Western Massachusetts Agency which provides a wide variety of services for veterans needing help, announced in 2012 that it planned to purchase the old school, located in a triangle-shaped piece of land between Meadow and Chicopee streets, and convert it into housing for homeless veterans. After years of work to get grants, loans and tax credits, to fund the about $10.5 million renovation, construction began about a year ago, said Joanne Beauregard, controller for Daniel O’Connell and Sons, which has partnered with Soldier On for the project. The renovations and purchase of the property is being funded with tax credits and different grants so the complex will not have a mortgage when it is completed, she said. The classrooms in the school are being converted into 43 one-bedroom units which will each have a kitchenette and bathroom. Each unit measures about 500 square feet, Beauregard said. The complex will be run similar to a co-op. Veterans initially pay $2,500 to buy a share in the building and each will pay a monthly rent that that is set under the Housing and Urban Development guidelines for low-income residents. The money earned through rent is put into an account to pay utilities, property taxes, maintenance costs and other expenses for the building, she said. Most of the veterans have some type of military benefits or other benefits and are eligible for housing subsidies so they can pay rent. Some also work, Beauregard said. Soldier On has a number of similar housing complexes in Western Massachusetts and other locations, including one in Northampton and one under construction in Agawam. The former Chapin School was considered an attractive location for veterans’ housing, in part because it is already on a bus line and across the street from Rivers Park. “We are happy to see a vacant building coming back into use,” she said. The building was originally an elementary school but in 2003 it was closed as a neighborhood school and used for an alternative school. It has been closed since Chicopee Academy moved to a different location in 2005. Some work, especially on landscaping, will probably continue after residents move into the apartments. Plans call for some of the blacktop that surrounds the building to be removed and replaced with plantings to make it more attractive, she said.